When it comes to building material choices, it’s hard to beat the environmental, economic and aesthetic benefits of wood. And with innovations in wood technologies, wood is now the wisest choice for more and more building applications, including mid-rise and even high-rise structures. Wood products are natural and infinitely renewable. They help fight climate change by storing carbon, and they have less embodied energy than steel or concrete. In Oregon, and throughout the Pacific Northwest, wood building materials are derived from sustainably managed forests that are a primary economic driver for many rural communities. OFRI’s wood products education program promotes the benefits of using traditional and innovative wood products grown and manufactured in the Pacific Northwest. The program aims to strengthen demand for wood products among architects, engineers, contractors and developers who design, specify and construct commercial and multifamily buildings. This includes educating design and construction industry professionals about the advantages of building with wood, and promoting the use of innovative mass timber products such as cross-laminated timber (CLT). The wood products education program was launched with the support of a two-year, $250,000 U.S. Department of Agriculture Wood Innovation Grant. OFRI also partners with a number of organizations such as WoodWorks and the Forest Business Network on conferences, wood building tours and other efforts to promote the use of Pacific Northwest wood products. Learn more about why you should build with wood. Oregon, and especially Portland, is home to more mass timber and tall wood buildings than any other place in the country. To showcase innovative technologies that are making it possible to build a wide range of structures with wood -including office buildings, apartment complexes, fire stations and schools - OFRI co-sponsors and organizes mass timber building tours in the Portland metro area. 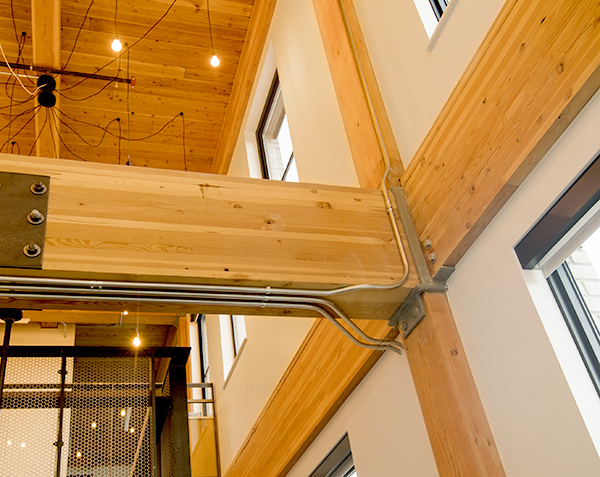 This allows participants to see for themselves the beauty, strength and versatility of mass timber construction. To learn more, contact Director of Forest Products Timm Locke at 971-673-3191 or locke@ofri.org. In addition to building tours, conferences and other educational efforts, the wood products education program produces publications, digital content and exhibits to inform architecture, engineering and construction professionals about mass timber construction, innovative wood products and the advantages of building with wood. These include Forest to Frame, a special report about advanced wood products and Oregon’s innovative mass timber construction movement, and Wood Stands Tall, a brochure outlining the many benefits of wood products. The choices we make about the materials used as we develop the built environment have long-term effects on our society and the environment. Wood is beautiful, strong, versatile and renewable. As trees grow, they remove carbon dioxide from the atmosphere and store it as carbon. With innovations in wood technologies, architects and engineers are now choosing wood for more and more building applications, including mid-rise and even high-rise structures.